Tag Archives for " Owen Video "
Ross Brand with your Livestream Universe Update and Flash Briefing for Wednesday, May 9th, 2018. The one that stands out for audience growth is live cross-posting. That means your live video can appear on multiple pages at the same time while aggregating the views. This is different from sharing videos. Cross-posted videos are treated as posts published by all the pages where they appear. Another new Facebook Live feature is called Persistent Stream Keys. Only one permanent stream key is needed to use the Facebook Live API, speeding the process for individuals and teams to go live. And Facebook is testing a live rewind feature that should popular when released. Viewers joining a live video in progress will have the option of going back and watching what they missed or catching a highlight and then jumping back to the live content. AT 12pm ET, it’s the Business of Video Podcast with Owen Video and Nick Nimmin. Guest Salma Jafri shares branding secrets. That’s on the Owen Video X Facebook page. At 2pm ET today, Mitch Jackson and Joey Vitale host LegalHour Live on the Legal Hour Live Facebook page. They will talk about GDPR and what online business owners need to know about privacy issues. At 5pm ET, it’s Camera Confidence Live with Molly Mahoney on the BeLive TV Facebook page. Molly will be discussing 7 Mistakes Most Business Owners make with Video Marketing. Ross Brand with your Livestream Universe Update and Flash Briefing for Wednesday, May 2nd, 2018. Facebook revealed plans for live streaming sports, comedy shows and concerts in virtual reality at yesterday’s F8 keynote. 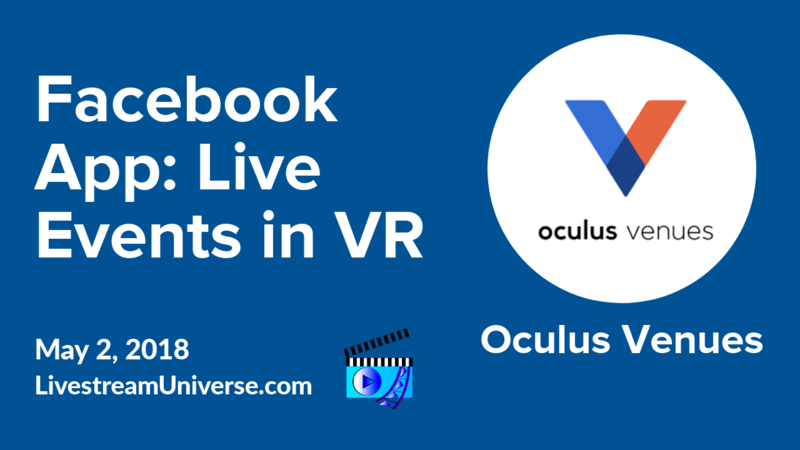 Oculus Venues is the name of the app and it will feature content from NextVR, which already has streaming partnerships with professional sports Leagues and Live Nation for concerts. Live social engagement will be a big part of the experience as you can watch events in VR with friends and lots of other people. The app will be available at the end of May on Oculus Go and Gear VR. 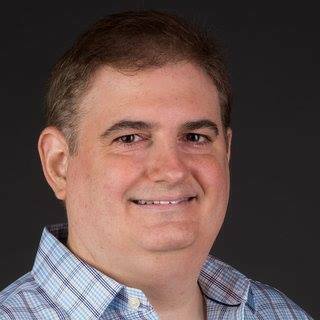 At 12pm ET, Chris Michaels of Wowza Media Systems is the guest on The Business of Video Podcast with Owen Video and Nick Nimmin. 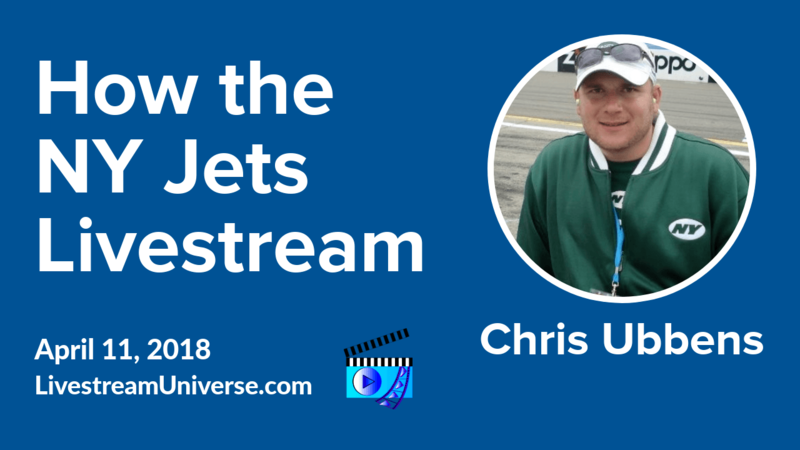 Chris will share live streaming tactics and tools on the Owen Videox Facebook page. At 2pm ET today, Mitch Jackson and Joey Vitale host LegalHour Live on the Legal Hour Live Facebook page. They will discuss the importance of copyright protection for your blog. At 3pm ET, it’s Camera Confidence Live with Molly Mahoney. Her guest is Kim Garst, who will talk about the balance between building a business and raising a family. That’s on the BeLive.tv Facebook page. And Facebook will be live streaming Day 2 of the F8 Facebook Development Conference today. You can watch it at f8.com/watch. Ross Brand with your Livestream Universe Update and Flash Briefing for Monday, April 23th, 2018. Are you a video creator who enjoys the livestream experience, but would rather produce pre-recorded videos? 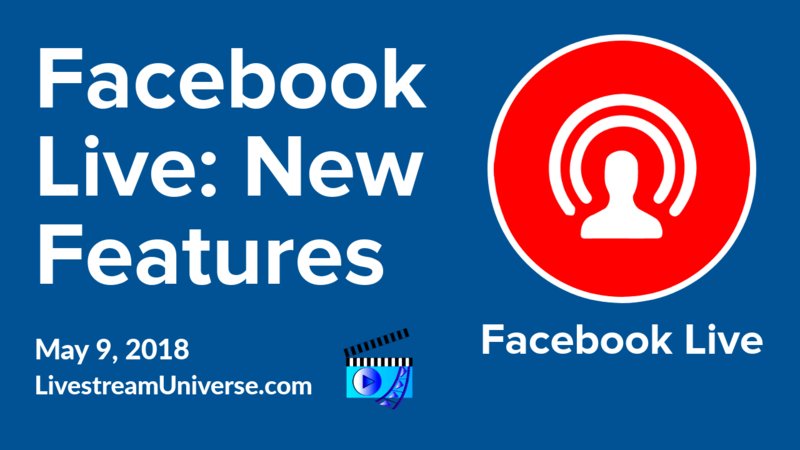 Facebook Premieres will enable you to distribute pre-recorded content as a livestream. This will create what Facebook calls “a live moment” with viewers able to interact and experience the video together. On Live Stream Insiders, Krishna De said this really isn’t anything new. Facebook says Premieres will also help video creators and publishers build excitement leading up to the release of a new video. The feature is currently being tested. Facebook says it will be rolling it out to more users soon. Krishna De and Peter Stewart host Live Stream Insiders Sundays at 2pm ET on the Live Stream Insiders Facebook page. At 3pm ET, Owen Video is leading an Ask Me Anything show on BeLive Weekly. He’ll have other BeLive hosts joining him to help answer your questions. Rachel Moore, Molly Mahoney and I will be there. That’s on the BeLive TV Facebook page. Ross Brand with your Livestream Universe Update and Flash Briefing for Wednesday, April 18th, 2018. Beyonce racked up the highest YouTube livestream viewership of any performance in Coachella’s history. She had 458,000 simultaneous live viewers during her Saturday set. Azania Noah is an international singer, song-writer and recording artist. She’s been invited to perform for 4 heads of state and in some of the most prestigious venues in the world. Azania won first prize in a French TV competition similar to American Idol. She was also featured on “The Voice” in France, seen by more than 8 million viewers. 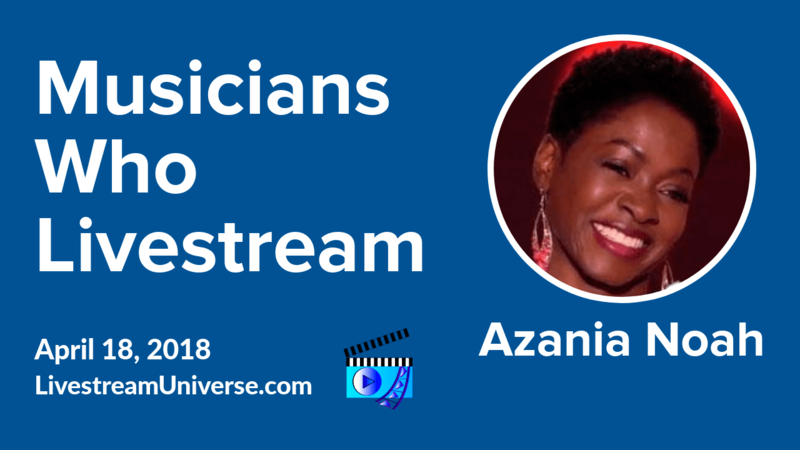 In addition to sharing her singing voice on livestreams, Azania uses live video meetings to provide vocal training and career coaching to aspiring singers through her Singer Elite program. Claudia Santiago is also a bilingual singer and international recording artist who performs live in many different musical styles. Claudia has a new album coming out soon. Her live streaming talk shows cover a wide range of topics including health, careers, women’s empowerment and art. She also livestreams her rehearsals. Claudia organized full-day music festivals in support of Mario Armstrong’s Never Settle Show. 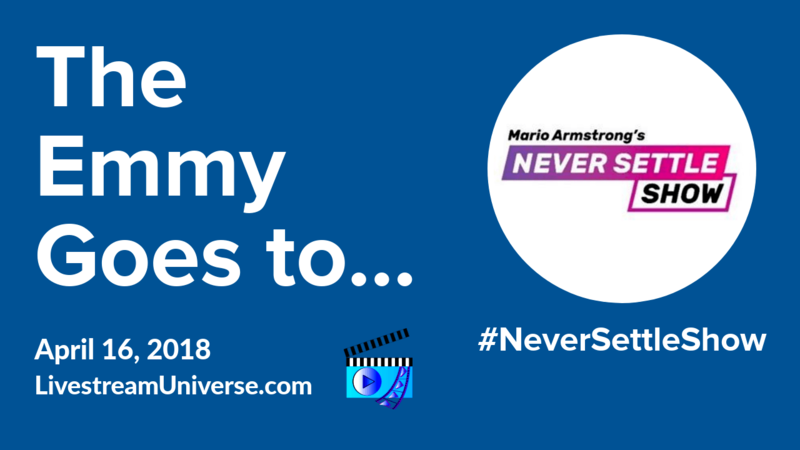 Speaking of the Emmy winning Never Settle Show, co-produced by Roker Media, the show’s band features Cassandra Kubinski on keyboards and lead vocals and Tony Daniels on guitar. Cassandra has released 6 albums and her songs have been chosen for tv shows and commercials. She’s collaborated with some of the biggest stars in the music business, including Billy Joel. She wrote the inspiring song “Not So Different” in support of Autism Speaks. Tony is an accomplished voice actor doing everything from movie and commercial characters to tv promos, animation and narration. He’s the voice of Tony the Tiger and does a wide range of accents. At 12pm ET, it’s the Business of Video Podcast with Owen Video and Nick Nimmin on the Owen Video Facebook page. Video Marketing World Founder Jeremy Vest shares million dollar brand strategies for YouTube. At 2pm ET, it’s Legal Hour Live with Mitch Jackson and Joey Vitale talking about what podcasters and live streamers should know when recording phone conversations. Do you need interview agreements with your guests? View on the Legal Hour Live Facebook page. At 3pm ET today, it’s Camera Confidence Live with Molly Mahoney on the BeLive TV Facebook page. Ross Brand with your Livestream Universe Update and Flash Briefing for Monday, April 16th, 2018. The Emmy nominees included Newsday.com, MSGNetwork.com and WPIX-TV, but the winner of the NY Emmy for Interactivity goes to Mario Armstrong’s Never Settle Show, co-produced by Roker Media. Cathy Nolan was a cast member and the show’s caricaturist during the Emmy-winning first season. She said an Emmy never crossed her mind when she joined the show. Cathy credits Mario’s hosting talent for the in-show engagement. Cathy said Mario’s own journey in creating the Never Settle Show embodies what the show is all about. What made being part of season 1 so special? Thanks to Cathy Nolan for spending time and sharing her thoughts on the Never Settle Show’s Emmy Award. You find out more about Cathy and see her artwork across social media at @cathynolanart. At 3pm ET today, Owen Video is leading an Ask Me Anything show on BeLive Weekly. He’ll have other BeLive hosts joining him to help answer your questions. That’s on the BeLive TV Facebook page. Ross Brand with your Livestream Universe Update and Alexa Flash Briefing for Wednesday, April 11th, 2018. You can see the entire sports show from NAB on the LiveU Facebook page. Also on the LiveU page — Jason Aron interviews actor, talk show host and standup comic Sinbad. Jennifer Quinn is a Live Video Coach and the host of The Jenny Q Show: Life and Business on Purpose. She’s the author of Leverage Livestreaming to Build Your Brand: Start, Master, and Monetize Live Video. Named the 2015 Queen of Blab, Jennifer created Facebook Live’s first variety show. Joel Comm has authored several best-sellers and has published more than a dozen books covering topics such as internet marketing, business and Twitter. 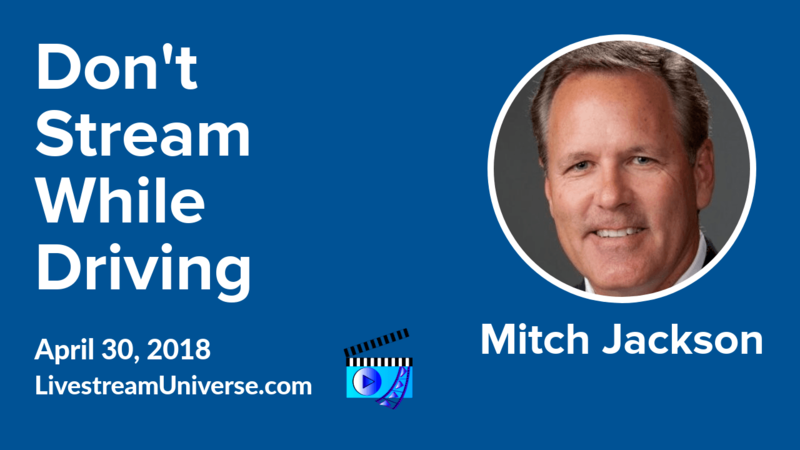 His book on live streaming is called Live Video Revolution: How to Get Massive Customer Engagement and Skyrocket Sales with Live Video. Joel co-hosts the Bad Crypto podcast, which is rocketing up the podcast charts. Peter Stewart is the author of The Live-Streaming Handbook: How to create live video for social media on your phone and desktop. Al Roker wrote the forward. Peter has an extensive background in broadcasting, including at the BBC. 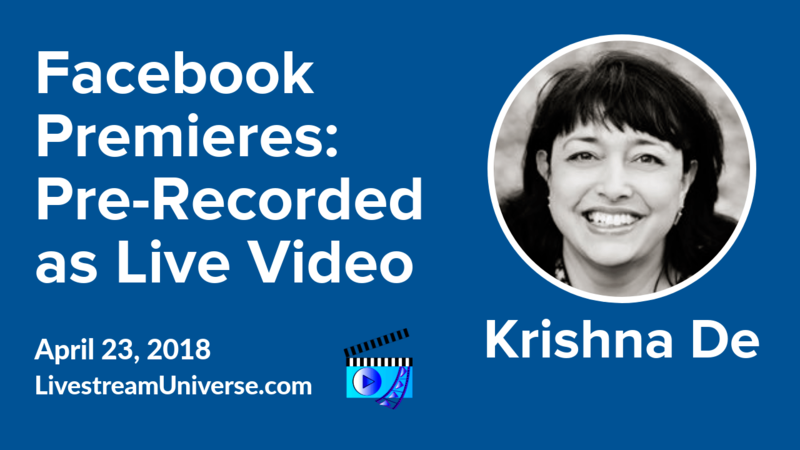 He co-hosts Live Stream Insiders with Krishna De every Sunday at 2pm ET on Facebook Live. At 12pm ET, it’s the Business of Video Podcast with Owen Video and Nick Nimmin on the Owen Video Facebook page. Their guest is magician Matt Fuhrman. At 2pm ET, it’s Legal Hour Live with Mitch Jackson and Joey Vitale. The topic is lawyer-client privilege and what every business owner should know. View on the Streaming Lawyer Facebook page. At 3pm ET today, it’s Camera Confidence Live with Molly Mahoney on the BeLive TV Facebook page. Her guest is Sharla Jacobs of the Thrive Academy, who helps entrepreneurs stop doing things that lose clients. At 8pm ET, LiveU hosts “The Studio Goes Rogue” from the NAB Show. Catch it on the LiveU Facebook page. Ross Brand with your Livestream Universe Update and Alexa Flash Briefing for Monday, April 9th, 2018. The National Association of Broadcaster’s holds it’s annual NAB Show Las Vegas this week. Exhibits run today through Thursday. 17-hundred exhibitors and 100-thousand attendees are expected, with a record 244 companies exhibiting for the first time. More than a million people watch the broadcast each year. 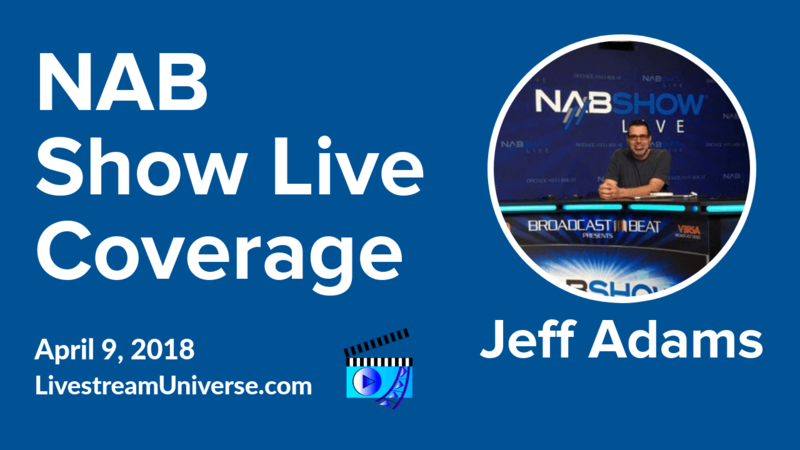 You can view live coverage of the event at NABshow.com. Also check out Jeff Adams Thursdays, 3pm ET hosting Live Positive on the BeLive TV Facebook page. Congratulations are in order for Jim Collison on reaching episode 350 of Home Gadget Geeks. Jim says he’s not into milestone shows and doesn’t plan on celebrating his 400th episode either. So what did our humble host do for Home Gaget Geeks 350? That was Jim Collison on Ask the Podcast Coach with Dave Jackson Saturday morning. You can see episode 350 of Home Gadget Geeks, and all of Jim’s previous shows, at TheAverageGuy.tv. Monday’s Must See Replay – Check out the latest Live Stream Insiders with Krishna De and Peter Stewart. 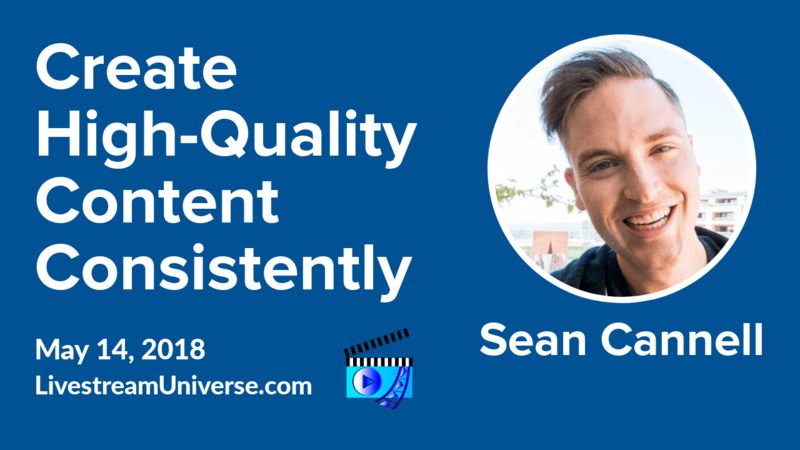 They cover lots of interesting ground including the upcoming roll out of Skype Creator, live streaming for the travel industry and Disney’s marketing priorities. View the show on the Live Stream Insiders Facebook page. Coach Jennie is launching Coach Jennie Live Mondays to Fridays at 12:30pm ET on the Coach Jennie Facebook page. Drop in for a cathartic shove and learn how to quiet your inner naysayer. At 3pm ET today, Owen Video hosts BeLive Weekly on the BeLive TV Facebook page. His guest is Phil Gerbyshak. They’ll discuss how to put together the perfect Facebook Live interview. And look out for the possible return of “Ask Mike Murphy” on Monday nights. Get your tech and podcasting questions ready.